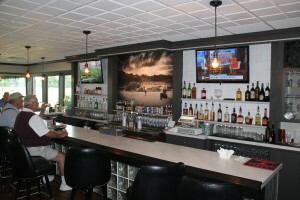 The bar and dining facilities at Pine Hills have undergone a major interior renovation over the winter of 2014, thanks in part by the design of DxDempsey of Scranton, Pa, which created an “old world, nostalgic” golf theme that will take you back to yesteryear. Our restaurant boasts an outdoor seasonal patio that offers breathtaking views of Montage Mountain. Interested in holding a tournament at Pine Hills next year? Pine Hills can host your post tournament party. With indoor and outdoor seating, our facilities can accommodate up to 144 golfers. For larger groups, there is sufficient area around the restaurant to put a tent up in an area close to our ninth and eighteenth greens, or on our Par 3 course. Pine Hills Bar & Grill can also accommodate business functions, reunions, and even weddings! Please call the restaurant for more details, 570-562-0138 x3. The restaurant also offers an on-site-catering menu with five different options to choose from.